We really are turning into Ozzie and Harriet, or maybe Ricky and Lucy. I went to bed last night thinking that I’d forgotten to put out the trash. What more suburban thought can I have? The trash has become important to me. The renovation has generated a lot of it, cardboard boxes, styrofoam packing, used masking tape, empty paint cans, unwanted toilets, old cabinets, and broken slate. 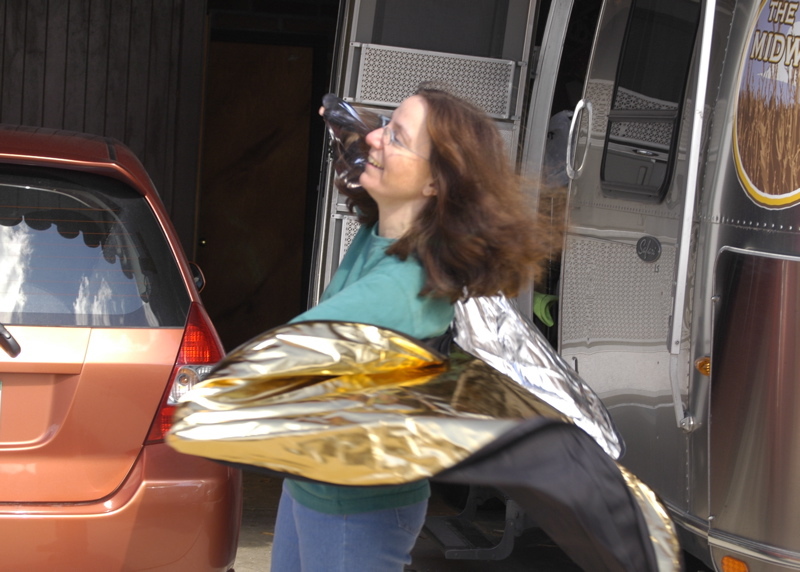 The recyclable stuff is easy to get rid of, and a few appliances have been given to good homes, but we have so much debris that twice I’ve recruited contractors to take away truckloads of trash they didn’t generate. Still the trash piles up behind the house. I have taken to staging the trash in a backyard queue. 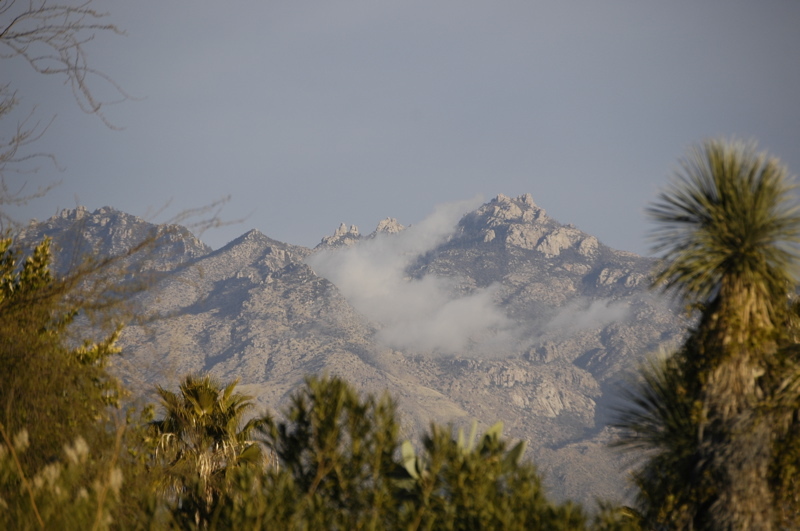 It constitutes the foreground of our otherwise lovely view of the Santa Catalinas. Someday, all the trash will all be gone and we will only have a view of the mountains. But for that to happen, I have to be diligent about getting the absolute maximum out of our single barrel trash pickup every week. Last night “Harriet” said, “Did you take the trash out?” And I said, “No, but I’ll get it in the morning. They never show up before 10 a.m.” Can you hear famous last words there? So early this morning, “Lucy” shifted in bed and said, “There’s the garbage truck.” And I said, “It’s still dark out!” It was 6:30 a.m., and yet there was the truck noisily working its way down the opposite side of our street. So I became Ricky Ricardo, and dashed out into the morning chill in my pajamas and bare feet to roll the barrel out from the carport to the designated spot by the curb. I finally went for the gray barrel of construction debris, and hauled that out front to dump into our city-approved green barrel. Even then, it was still only half full, and the truck was still in the cul-de-sac. Back to the yard again for another shopping trip. This time I picked up three empty paint cans, and some styrofoam. I was going for bulk rather than weight, since I had lots of space left and I didn’t feel like doing any heavy lifting. After all it was 6:30 a.m. — did I forget to point that out? Finally the barrel was full, and I went back to the Airstream into my nice warm bed. Four hours later, the garbage truck showed up. The truck we had heard at 6:30 was not the garbage truck. It was the recycling truck. It has been a perfectly nice day here in Pleasantville, but I am wondering how much longer we can stay here and pretend to be normal. Obviously Eleanor is starting to crack already. In addition to her superhero fantasies, she has proposed we hitch up the Airstream this week and head to Tempe or Casa Grande to go to a festival and do some furniture shopping. We may yet do that, even though we don’t really need to. It’s just that sitting still is hard to get used to, and when the trash pickup starts to loom large in our priority list, we both know that it may be time to get outta town for a few days. That Great Horned Owl is taunting us. We still haven’t spotted him, but he seems to wake up in the afternoons just long enough to hoot a few times. Twice we’ve been out on walks around the neighborhood to try to track him down, me with my long zoom lens on the Nikon, Emma jumping around excitedly, and Carol peering up into trees, but we never see him and he is always silent after the first few hoots. He’s out there, somewhere. He lives in the neighborhood, sleeping amongst leaves or fronds where he can be hidden from view, and only at night does he silently fly from tree to tree and hunt for dinner. The only way we can find him is by his calls, and he only calls when he cares to advertise his presence, which isn’t often. He knows he has the advantage, with far superior sight and silent wings. But we’ll get him — with the camera — sooner or later. The owl provides a bit of comic relief to our otherwise dull house duties. We passed two small milestones today: the dishwasher arrived, and we finally managed to order shades for the windows. You might not think that those two items are really all that difficult, but if so it only proves you’ve never done a full house renovation. A kitchen renovation alone is cause for obsessive behavior that should rightfully cause one to be medicated if not locked up. At first it is a simple thing: go get a few appliances, order the cabinets, then sit back and relax while the contractors do the work. But soon the details begin to overwhelm. It’s not long before you are stressing out over things you have laughed at only a few weeks before. Should the countertop be Formica, granite, Corian, stainless, butcher block, tile, marble, concrete or some mixture of types? Should the drawer pulls be traditional or modern? Should the undercounter lighting be fluorescent, halogen, LED, or krypton? It goes on seemingly without end, and the people in the retail stores are no help because they like to point out (and thus magnify) the tiny “flaws” in your design. “Of course, you could go with that oven, but then the stainless won’t exactly match the stainless on your refrigerator.” Suddenly, you realize how wholly inadequate imperfectly matched stainless would be. Friends will come over for dinner parties and notice how you apparently couldn’t afford the complete set of Thermador or Fischer-Paykel appliances. There’s only one solution: go upscale to a point where everything matches perfectly, and the child’s college education fund is gone. She can always get student loans, right? We’ve tried to hold the line on this sort of thinking, but there’s no question that the house is getting fixed up a bit more expensively than we’d first planned. So today tangible evidence of that phenomenon arrived, in the form of a special order Bosch dishwasher, which I call “the dischwascher”. It is a Teutonic marvel, washing dishes in a tiny amount of water while making less noise than the refrigerator. It is even more amazing that we need such a thing, since we have had no dish-washing machinery in our lives since 2005, and haven’t really missed it. But now the dischwascher has arrived to fill a gap in our lives that we didn’t know we had. The shades were more of a problem. All I wanted was cellular shades for some of the windows. Our bedroom is basically 50% glass, so shades were critical to having any privacy at night. A few other places in the house also needed shades. But it took four trips to the store, three measuring sessions (one by a paid contractor and two by ourselves when we realized we’d need additional shades), and multiple sessions with the shade books before we could finally place our order. The decision process was so complex that I was about to write a computer program to figure the possible permutations and then select which ones would work for our window sizes. Imagine going to Burger King and discovering you have to choose from 1,286 possible combinations of Whoppers, and only after you’ve measured your colon can you actually place your order. All I wanted was a stinkin’ shade so the neighbors wouldn’t have to watch me getting into my pajamas. Well, the cellular shade order has been placed, and it’s a huge relief. Every time we get past one of these steps I feel like I just left the dentist’s office. You know the feeling: your jaw is still numb but you’ve got a spring in your step because you know you don’t have to go back for a long time. Hopefully, I won’t have to order shades or dischwaschers again for a long time. Counting forward, I see at least a dozen more steps before we can call this job done. We are halfway through the mental root canal that is a house renovation. That means a little time pressure is cropping up. I’d like to have it in good shape before Bobby & Danine get here. We are expecting them in the next two weeks, with their Airstream. Not that we’ll be in any shape to cook them dinner by then, but at least we’ll all be able to admire the gleaming new kitchen before we go out for something to eat. Perhaps the owl will join us. We’re like real suburbanites now. 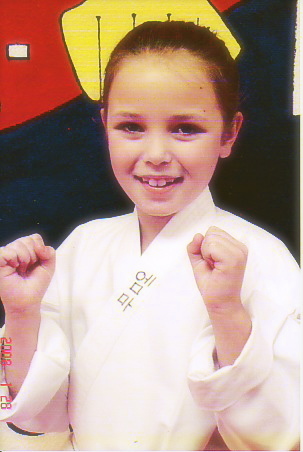 We’ve enrolled Emma in karate class for the duration of our stay (about six weeks). My, how things have changed since those carefree days on the road. If this trend toward settling keeps up, pretty soon we’ll be buying a recliner from the local Lazy-Boy outlet and calling Dominos for takeout pizza. Ah, but don’t be fooled. This is just a front we are putting up to confuse people. Just when the neighbors think they have us figured out, we’ll suddenly pull up stakes (or in the RV world, “unchock the wheels”) and disappear again for six months or so. It won’t be long before we are heading east, and we already have a rough plan that goes through September. While we are here, we might as well drink deeply of the local experience, and enjoy all the benefits of stationary life while we can. It’s the same philosophy that has served us well while on the road. Thus, karate lessons. It looks like Emma will take very well to karate. She learned quickly in her first lesson and her only barrier seems to be that she wants to be perfect the first time out, and takes it hard if she’s not. This is a feature of her personality that has been evident since birth. Sometimes it works in her favor, other times it doesn’t. Her karate Master will probably be helpful in teaching her to manage it. And the class looked like fun. I’m tempted to sign on as well. Of course I violated the cardinal rule of photography (always bring your camera), and so missed out on some truly priceless moments of Emma getting her initial one-on-one lesson with her instructor. All I have is the photo above, which is the standard classroom shot that the school takes. Don’t make my mistake — always take the camera! Back at the ranch, everyone professes to be amazed at how much we’ve accomplished, but to us the pace feels rather slow lately. Not much will happen to the house in the next week, while we wait for kitchen cabinets to arrive and a replacement window. However, we are laying groundwork for the next flurry of activity, by getting some quotes and setting up schedules. The house will be done enough to inhabit fully by mid-February, although I suspect it will never be completely “done.” That’s the nature of houses. We took another step toward finalization of the house yesterday by ordering a couch. This will be the only expensive piece of furniture we buy. We have decided to live minimally in the house this spring, meaning that we will buy a few dining room chairs, a couch, two mattress sets, and maybe a lamp. A couple of inexpensive organizers from IKEA could show up, too. Our bedroom suite, other than the bed we already own, will be Rubbermaid tubs. We’ll have plenty of time to furnish it more completely next fall or winter. Speaking of IKEA, our plan was to take the Airstream to Tempe for a few nights (80 miles away) and browse the furniture stores there. But it turns out that the SuperBowl will be in Glendale (another Phoenix suburb) and all the campgrounds are completely booked. Even the Super 8 is rumored to be charging up to $450 per night. So we’ll stay put in Tucson this week and perhaps take the Airstream up in two weeks instead. But isn’t it nice to have an Airstream to facilitate shopping trips like that? Yet another use for it. I have no idea how we managed to live before we had one. There are certain things that go with Airstreams. One of them, I’m coming to realize, is ukuleles. Bear with me on this one. It’s all Tommy Green’s fault. He poured gasoline over my inner desire to learn a fun solo instrument and tossed on a match. Now I’m hooked on the uke, playing it as often as I get a chance in the hopes of being good enough someday to play in front of people who don’t already tolerate me. The ukulele is an ideal instrument for the Airstream: it’s small, light, fun, and good around a campfire for sing-alongs. Try that with a harp or a trumpet. Sure, a guitar or harmonica is good too, and very traditional, but sometimes players of those instruments can’t resist the temptation to play depressing songs. It’s hard to play a sad ukulele song, and most of the time the thing is so darned cheery that you just don’t want to. Those of us who are uke nuts have plenty of heroes. Ever heard of Jake Shimabukuro? You’ve never heard uke like this guy can play. Try his rendition of “While My Guitar Gently Weeps,” by George Harrison. It’s amazing. It sure isn’t the annoying stuff you remember from Tiny Tim on “Laugh In”. Or how about “Iz” (Israel Kamakawiwo’ole)? He was huge phenomenon in the ukulele world (sadly, he is now deceased) and I’m not talking about the fact that he weighed about 500 lbs. He’s like a deity in Hawaii. Guys like Iz and Jake are so amazing on ukulele that every time I hear one of them I have to get my uke and strum a few chords. Jake, Iz, and a few other guys are taking over my iPod, so if you ride with me you’ll get to hear them. I think the nicest thing about the uke is that you can learn it much more easily than a six-string guitar. It’s something almost anyone can do with some practice, and before you know it you’re strumming your way through a song. Of course, being enthusiastic about it, I’ve passed on the disease. Bill Doyle and Larry Ko, our Airstream friends from San Diego, have started up on uke. Now we’re exchanging tips and chord tabs via email. I don’t know where it will stop. At this point, it’s not just a few nutty guys — it’s a movement. You may want to join voluntarily before we kick in your door and hand you a uke. My current challenge is to get a lot better at strumming. I need to learn some new patterns besides the basic up-down strum. I also want to expand my knowledge of chords considerably, so I’ve chosen a fairly difficult song to learn in the next few weeks: “Blue Skies” by Irving Berlin. It sounds great on uke — really. My family will be entirely sick of it soon, but I’ll try to keep their pain to a minimum by practicing in the house when they are in the Airstream, and vice versa. And that is another reason that Airstreams and ukes go together. Airstreams make great practice studios — just ask Eddie Vedder of Pearl Jam why he bought a Bambi. I can see a future where Airstreamers gather in huge groups not to chat and chew, but to camp and jam. Wouldn’t that be fun? Grab a soprano uke for as little as $47 and get started. I’ll listen for you this summer. Aloha. 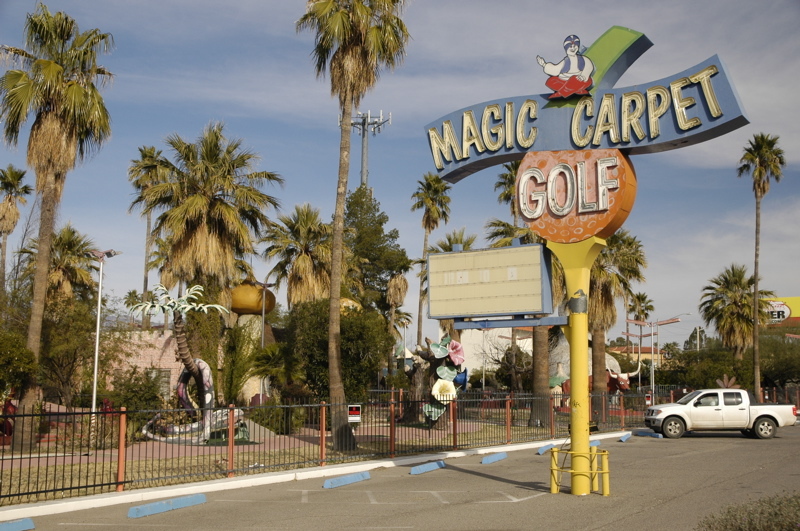 Today I was lucky enough to join other members of the group “Vanishing Tucson” at Magic Carpet Golf, on East Speedway Blvd. 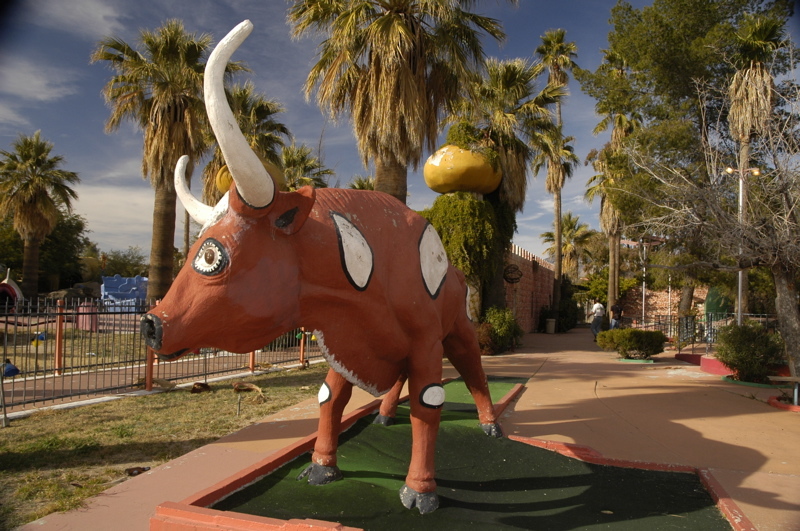 This old course finally closed recently, ending what I believe was a 50+ year stretch of business in Tucson. It will eventually be razed to become a parking lot. 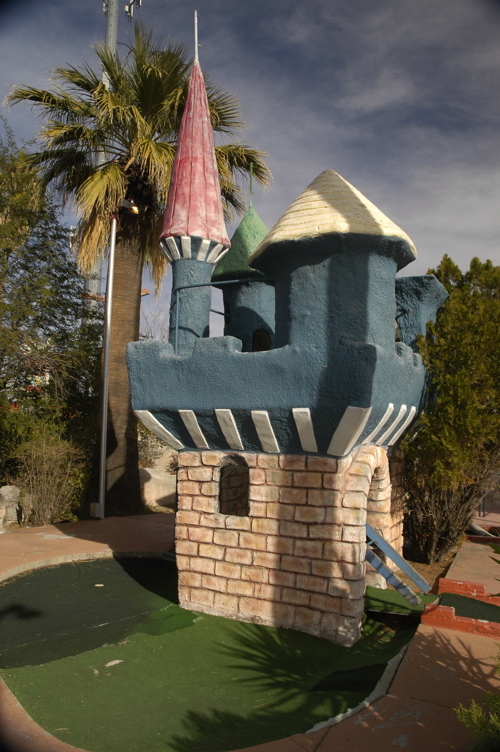 Magic Carpet Golf is one of those places that long-time Tucsonians remember dearly from their childhood. The entire place was handmade with fantastic concrete sculptures, colored lights, and exotic scenes. It became rather shabby toward the end, but still the sculptures stand in testimony of decades of service. 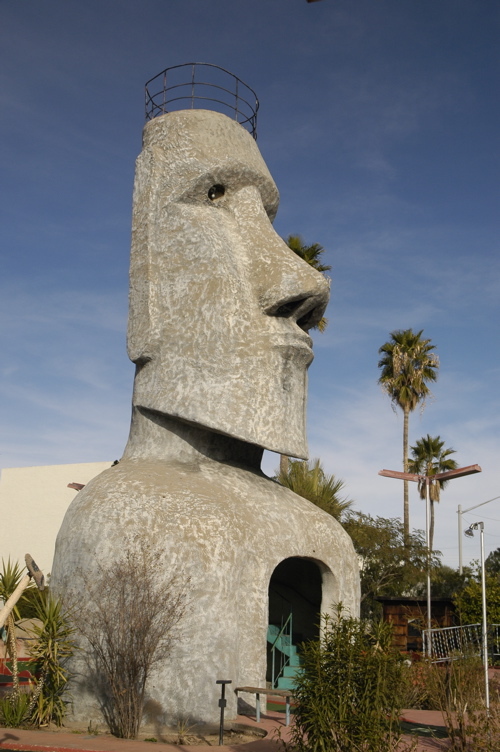 There is talk of moving the sculptures to another location for preservation, but I don’t see how it will be possible. They are delicate and crumbling, made on-site mostly from wire and concrete, and in many cases firmly anchored to the ground. 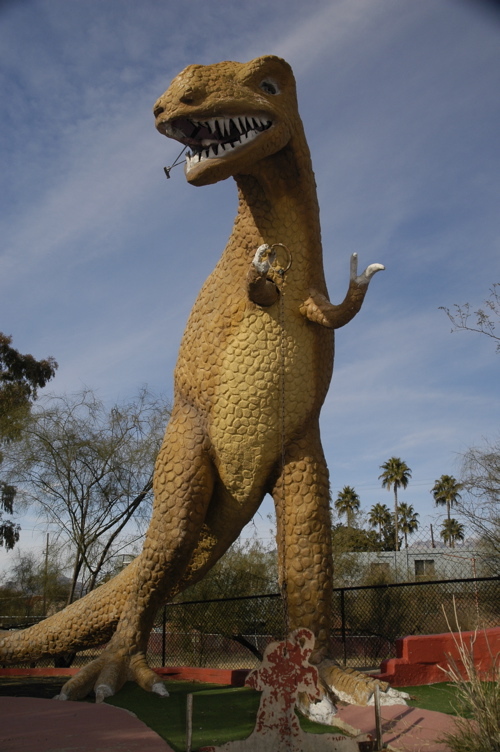 Moving that T-Rex would be an operation akin to removing a real 65-million year-old dino fossil. So about a dozen of us went over to take pictures today. The caretaker let us in (by prior appointment) and we wandered through the grounds looking for history and art. We found decay and mold, rotten wood and torn “greens”, but also a bit of imagination and fantasy. Someday Magic Carpet Golf will be only a memory. 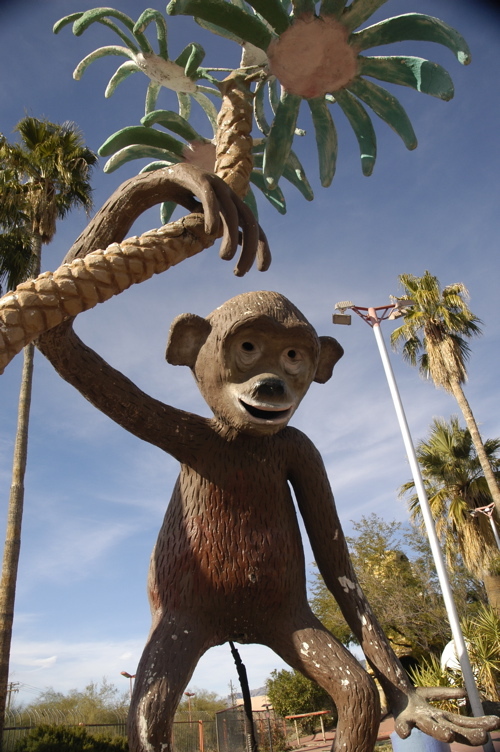 The undulating greens will be smoothed, the dinosaur and giant monkey will be reduced to powder, the buildings will be torn down and the palm trees will be dug up and sold. When that happens, we’ll have the photos, and they will eventually be treasured by someone who wants to see how things looked in the old days. I guess I’m getting a particular appreciation for this sort of thing because I am often looking for historical photos these days. In Airstream Life magazine we regularly publish articles about the history of Airstream, Wally Byam, travel trailer manufacture, and exotic caravans. When I find a family photo of someone’s vacation to the Florida Keys or Niagara Falls taken in the 1950s, it’s like finding a nugget of gold. That ordinary snapshot becomes a little piece of history preserved. 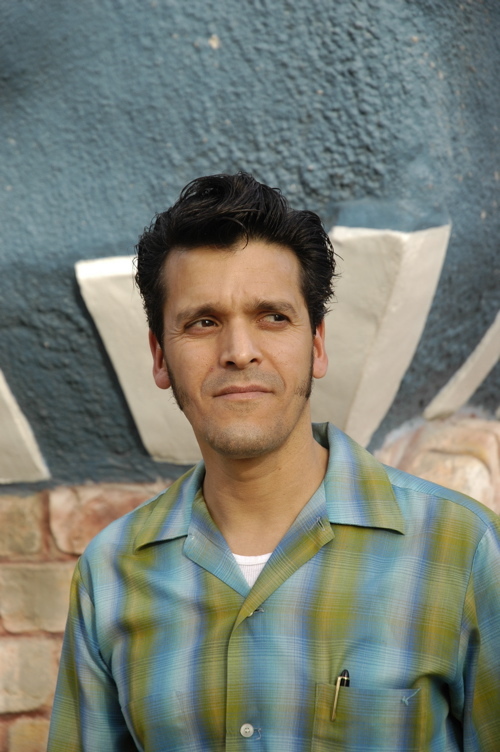 In any case, I am indebted to the leader of our group, Carlos, who takes a personal interest in the historic pieces of Tucson that are being quickly reduced to parking lots and sterile chain retail stores. I’m looking forward to a few more opportunities like this, documenting pieces of Tucson that have nearly vanished or are in danger of disappearing soon. It’s a way to bond with the city and learn more about it, and a good way to keep my camera at work too! On some evenings we have had the pleasure of the gentle hooting of an owl, just outside our house. We can hear him even when we are inside, so we know that he comes close. But we’ve never seen him, until tonight. We were in the Airstream having dinner when we heard our neighbor Carol calling quietly, “Eleanor, are you there?” Carol is a birdwatcher. We piled out of the Airstream’s door and over to Carol’s back yard, where the silhouette of a large Great Horned Owl was clearly visible in a tree. He was communicating with another owl. The two were hooting back and forth to each other across the alley, and it wasn’t long before we spotted the second owl also perched high in a tree only about 300 feet away. I ran to the house to get my camera and tripod, but before I got back, the owl closest to us flew over to meet the second one. A few minutes later, perhaps after a little owl tryst, both disappeared. This little episode reminds me that we don’t have to be out on the road for us to spot amazing little bits of nature. We’ve never seen a Great Horned Owl in the wild before. 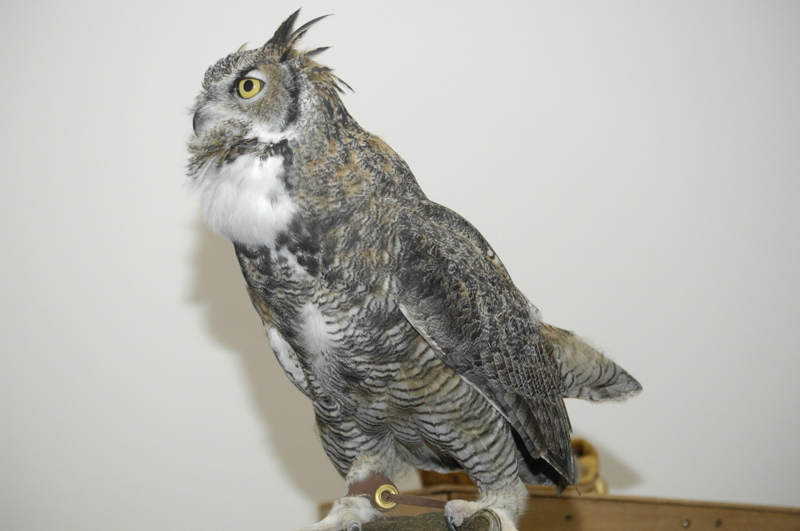 The one pictured above was a rescued bird in the West Yellowstone bear and wolf center. Having seen this magnificent owl puffing up his breast and hooting at us in a classroom made it all the more exciting to finally spot one in our back yard, even if all we could see was his silhouette and characteristic ear tufts. Having failed to capture our owl visitor with my camera, I set up outside the house for some night photo practice. The tough thing about getting good night shots is knowing what’s in your frame. It’s hard to compose a shot in the dark, so often I’ll have to take several test shots just to get a sense of composition and set up the proper exposure. But night photography can be very rewarding, too. 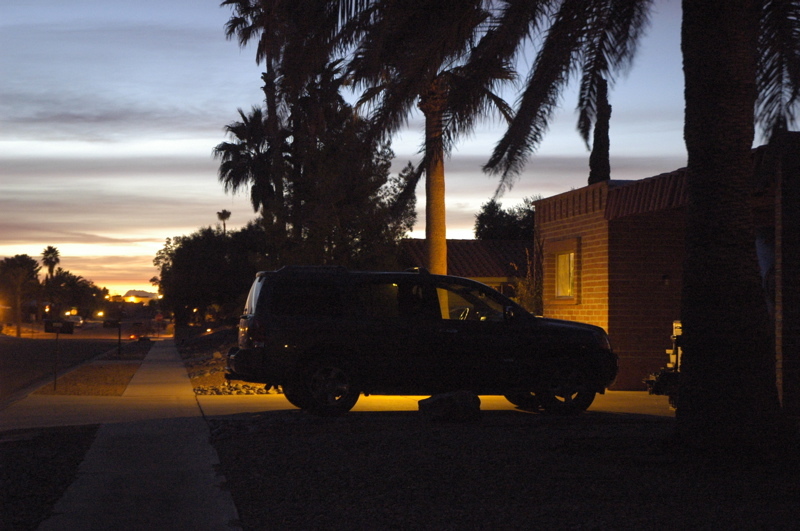 The drama of an ordinary suburban street can be magnified at dusk, and with a little tweaking of your camera’s exposure you can make dusk come earlier or later as you wish. I like doing it. The photo at left was shot with a 1.6 second exposure at ISO 1600. Although you can’t see it in this reduced version, the full image is a bit grainy in the blacks, which is the price of using such a high ISO. It wouldn’t stand up to being even a half-page in the magazine, but for just playing around it’s fine. I often get asked by people which camera they should buy. It’s not the camera so much as the photographer. If you want to buy something new, consider getting a tripod to start. Also make sure you know how to override the auto flash on your camera. Read the manual! You’ll be amazed at how much you can do even with an entry-level point-and-shoot digital camera these days. Take lots of pictures — they’re free (and don’t hesitate to delete the bad ones). And then, when you’ve got a good Airstream-related photo, put it up on our new Media Community so we can all see it! As I write this, I can hear the hooting of the owl again. He’s back near the house. I’m going to leave my camera on the tripod for the next few days, and try to capture him at dusk. I don’t expect an amazing photo at the distance I’ll be shooting, but it will be interesting to see what I can get. Brett said he wanted to see the border town of Nogales (Sonora, MX) on his last day in town. While I’m not a fan of border towns in general, it is an interesting place to visit if you only have an hour. Once you’ve visited it you can claim you’ve been to Cuidad Juarez, Tijuana, and all the rest because once you’ve seen one border town, you’ve seen them all. On the lighter side, there were literally heaps of iron sculptures, colorful rugs, leather boots, ponchos, and cattle skulls. I had no idea cattle skulls were so popular with the tourists. 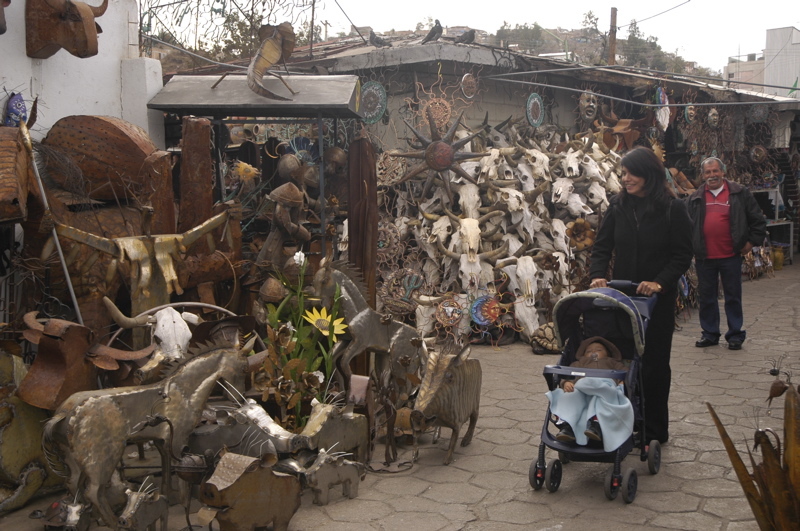 We were joined in our walk around Nogales by Patti, the Mexican wife of a friend who lives in Nogales (Arizona). She steered us through the maze of shops and hustlers, and saved Brett from buying some fake silver. He found the real stuff eventually. If you buy silver, be sure it’s the real thing. The sellers weren’t trying to defraud him, but there was a momentary language barrier until Patti stepped in. Real silver is marked as such, and the metal is not any cheaper in Mexico, so if you see a nice “silver” bracelet for $8, think twice. I got a chance to do some brainstorming with Patti about future trips to Mexico. She and my old friend Felix have a house in Sonora near the Sea of Cortez. It just so happens that there’s a nice open space across the street from their house, so I’m going to try to put together a gathering there, perhaps as a jumping-off spot for San Carlos and other towns. I also got some tips on things to do (and eat) in Hermosillo, so I’m greatly encouraged. The challenge will be finding the time in February or March before we head out of the southwest for the season.